My family finally got out for our first camping trip of the year this past weekend, and the stars aligned to make it a great time; we had excellent company, a great campsite where nearly every neighbour surrounding us spent the day away, the weather was determined to remain pleasant for us despite thunderstorm warnings and severe weather watches, and everyone seemed set on having a good time. Now, some of our weekend's niceness was fortuitous, but some was 100% thanks to planning and preparation. The food was one such area. I used to think the only things that could be cooked over an open fire were hot dogs and marshmallows - after all, that's all that my family ate whenever we went out camping. But over the last few years I have been enlightened; I concluded that if something could ever be cooked over direct heat, i.e. A stove top, that it could be successfully done over a campfire. I've been working to hone my skills of fire building and coal stirring ever since this epiphany, observing that consistent and even heat are often crucial to the success of a recipe, and this weekend I finally felt like every meal was well done. In anticipation of arriving at our campsite about an hour before supper time, I pre-stuffed a whole pink salmon that had been taking up space in my freezer ever since I found it on sale for about $0.20/100 g a while ago. I used my Grandma's recipe which calls for a Lemon Thyme rice stuffing. I stuffed the fish and wrapped it in foil, then set it on ice in our cooler. Any leftover stuffing I also wrapped up in a foil packet. Once we hit our campsite I built a fire right away, and laid the salmon on the grate over the fire to cook while we set up camp. I turned it after about 30 minutes - around half way of its total cooking time. I could smell the lemony stuffing when it was getting close to being done, and at that point I cooked up the mushrooms in both oil and butter to give it maximum heat tolerance and flavour! I hate mushrooms, but I loved this - no additional seasoning required! The mushrooms cooked until they had a crisp coating, and the salmon was perfectly cooked to flaky goodness. Slice up some lemon wedges and you've got one epic campfire meal! The next morning we cooked the bacon and sausages in the cast iron pan. The only thing I'd change for next trip is to bring a second pan! But given that I was awake since 5:30 a.m., I suppose I had plenty of time to cook in small batches... If you've never used pie irons, I pity you. I was only introduced to these wonders after I got married; my husband's family fully embrace the pie iron cooking method. As a brief rundown, you butter the heated insides of a double sided square pan, about the size of a piece of bread. Then lay your bread on one side and add fillings to it. That can be an egg, pizza fillings, sandwich toppings, pie filling, pulled pork, Caprese salad fixings... Anything your heart desires. Then you top with another piece of bread and close it up, then cook it in the coals until the bread is nicely toasted and the fillings are heated. As I mentioned in my menu, we tinkered with the traditional methods this weekend. First, I brought a tube of refrigerated biscuit dough that we filled with chocolate and/or cherry pie filling. The secret to these was to coat the biscuit in butter as soon as it was out of the fire and to let the butter bake in a bit as the dough cooled. Sooooo yummy. Experiment #2 called for the round pie iron; I cracked an egg in a well greased iron (bacon grease worked best for this one) and set a piece of back bacon on top. While that cooked I opened up an English muffin and heated it on the grate, with a cheese slice on one half. After a very short time, the egg and bacon were perfect, and popped right out onto my English muffin. So, so, so good. I also mentioned doing nachos for lunch. I pre-diced tomatoes and peppers at home, and even brought pre-grated cheese, so it was as simple as dumping everything into a foil pan, covering with foil and cooking. For the beans we merely took the label off a can before we opened it up and set it to cook on the grate over the fire! Bannock is a family tradition in many families, although the traditions can vary widely! My husband's family are bannock rolled in cinnamon sugar, and cooked it as a tube wrapped around a stick.My family cooked it as a cool on a stick, and ate it rolled in butter alongside steak strips with seasoning salt. Many people I know enjoy it with jam, and lots of recipes call for cooking it in a pan. Long story short, it's hard to go wrong with bannock. This trip I could not find Bisquick at the grocery store - my morher's 'secret ingredient' for her bannock dough. So instead I used my actually-top-secret scone mix recipe to make base that would only require the addition of water, and mixed it up on Sunday afternoon for our brunch. The only complaint I got (from my husband who does not believe in tampering with tradition) was that it was 'too flaky'. Is that even a real thing? Anyway, I thought it was perfection on a stick. And the kids sure loved it, too. I suppose I should mention one more critical kitchen tool for camping: a French press! 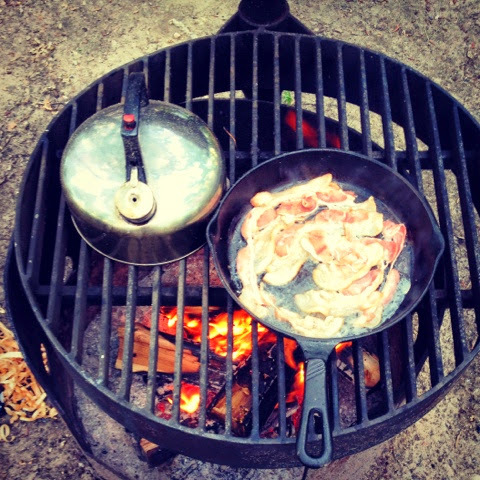 No need for inferior coffee while you're out camping - just use your French press and enjoy every last drop! I loved our camping coffee so much that when we got home I broke out my French press for my morning brew! I've got some ideas for new pie iron fillings next time we head out camping, and I might see just how gourmet I can make those bad boys! But looking back over our weekend camping trip, mostly I'm just glad we didn't spend the whole weekend eating hot dogs! Wow - sounds so yummy! Where can you get these iron pie irons? The trick with pie irons is to make sure you get cast iron, as opposed to aluminum. Cabelas and Bass Pro Shops usually sell theirs for $20-$25, and HomeSense had some round ones for around $20, but there's a rumor that Princess Auto has the good ones for $15, but I've yet to see for myself that they are cast iron.